Milton Keynes Community is very pleased to announce the good news of establishing the New Vihara (Buddhist Centre) for the welfare of our community. Our effort is to benefit from and share the teaching of Lord Buddha for all walks of life without any obligation to improve the quality of life with wellbeing, happiness, prosperity, protection fulfilment and progress in life. If you are interested in this project, please do contact us to get involved. Since 2007, Community in Milton Keynes has been doing various activities like, Children Dhamma Schools, Mindfulness Meditation Programmes, Cultural Events and many other blessings programmes with the guidance of Venerable Akurala Samitha (Bhante Samitha). With the growing benefits of its valuable services we formed charitable organization in 2017 to set up a Meditation and Community Centre. This has come into reality and we welcome you all to join this graceful occasion of opening the centre. Lord Buddha highly appreciated the offering accommodations and setting up monasteries. (Vihara daanan sanghassa – aggan buddhena vannithan). Those meritorious deeds spring merits & blessings forever day & night. (Thesan divacha raththocha – sadaa punnan pavaddhathi). We do greatly appreciate your participation at this event. The future of this noble project depends very much on the goodwill, commitment and generosity of everyone. For further details about how you can help please contact Ven. Akurala Samitha or the Inquiries Desk at the ceremony. The organisers would like to kindly request from all guests that please consult the organizing committee before you prepare something to make our effort more meaningful to fulfil our objectives rather spend for thing that are not useful. You can reserve a pirikara, atapirikara or robes to offer at the Atavisi Sambuddha Pooja or make a donation to the Milton Keynes Vihara Fund. 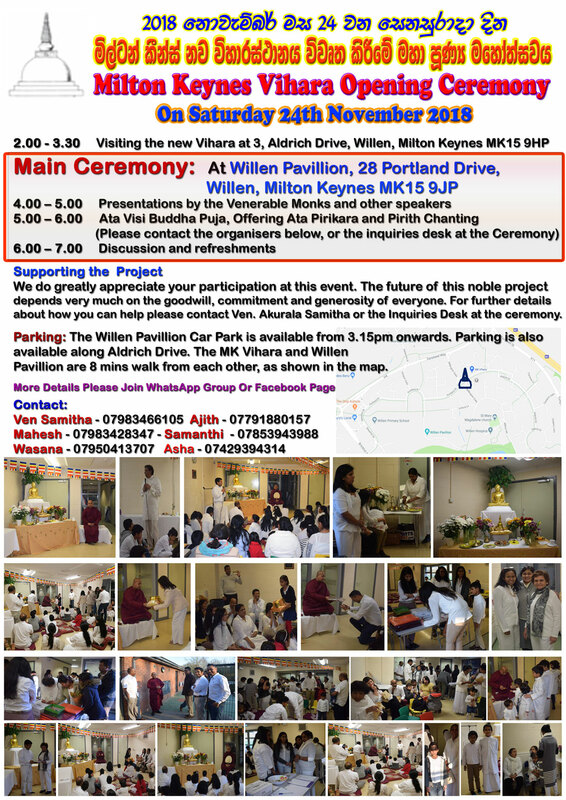 Forms are available at the Vihara premises and the Willen Pavillion. Those wishing to book an Ata Pirikara Puja in advance please contact. Ajith on 07791880157 or Samanthi on 07853943988. The Willen Pavillion Car Park is available from 3.15pm onwards. Parking is also available along Aldrich Drive. The MK Vihara and Willen Pavillion are 8 mins walk from each other.